vulture moon, originally uploaded by jahansell. Out and about today - took lots of pictures which I'll share over the next few days. Meanwhile this was a cool catch! Neat. 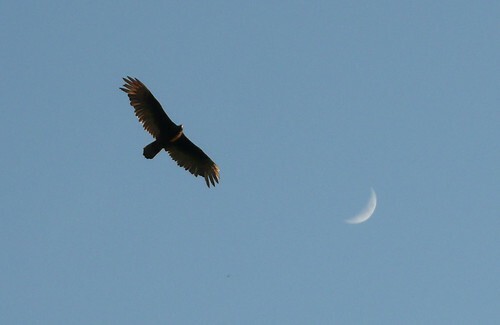 I took a lot of photos yesterday of buzzards. And mine look a lot like this one. Mine are of Turkey Buzzards. I almost fell over from looking up sighting through the camera. Beautiful photo. I really like how you captured this. Makes you wanna soar like the eagles! this truly is one amazing shot - you and Abraham Lincoln do some really neat nature shots with all these wildlife animals its wonderful to see - makes one appreciate the things around us. Wow beautiful! Great pic. I love that! beautiful photo w/ the moon it is so mystical. I really love this shot so much.